SCED Menu Show search box. Become part of the next generation of science teachers and educators to advance excellence and equity in STEM education. For more information on science education career path options, see our Career Q&A. Do you want to teach math or science in middle or high school? Then we have scholarships for you! Graduates, families and friends join the Department of Science Education to celebrate their academic achievements and accomplishments. Haley Vlastelicia, Adriana Ayala, and Rebekah Anderson receive Academic Honors at the 2017-18 Graduation ceremony. Congratulations Dicha Perez-Montalvo (L) and Grace McDonald (R) recipients of the 2017-18 AY Outstanding Graduating Senior Award. 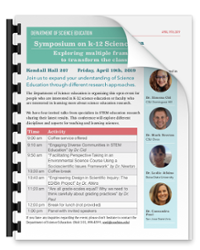 Join us to expand your understanding of Science Education through different research approaches. The Department of Science education is organizing this open event for people who are interested in K-12 science education or faculty who are interested in learning more about science education research.